Are you interested in HESTA income stream? Or, are you looking for general information about an income stream? This blog post will cover all these topics and help you to set up your plan. Also, I will share my interesting analysis based on actual customer reviews. Let’s first start with the general information and customer reviews. A retirement income stream is like receiving a regular salary. You receive what you have accumulated while you work for your employer. This regular income stream is tax-free, and you have to be over the age of 60 to be eligible for the income. Why would you need this extra income stream although the Australian government pays you Age Pension? Receiving your super fund on a regular basis that I just mentioned. Although there are multiple options, more Australians are learning the benefits of income stream. This option allows people to start accessing super while the Super fund is still invested. Now that we just have learned about the income stream, let’s find out HESTA Income Stream more specifically. HESTA income stream is not very different from the explanation above. First, you need to know that there are two types of options you can choose. boost the super account balance while still working. reduce working hours without damaging your income. continuously receive a regular payment into your bank account directly (government limits applied). pay up to 15% tax only on investment earnings. become eligible for tax-free income payments from age 60.
reached your preservation age and keep working part-time or full-time (or intend to continue working). access tax-free income stream payments starting age 60 (tax offsets available before 60). make tax-free investment earnings using Retirement Income Stream Investments. have flexible payments options (governments limits applied). get a regular income directly to your bank account. reached your preservation age and retired fully. terminated an employment arrangement on or after age 60.
be age 65 or over OR be permanently incapacitated or terminally ill. I mentioned preservation age several times, then what is it? It depends on your date of birth. So, when you have reached your preservation age and want to access an income from your superannuation while you work, you may be eligible to open a TTR Stream account. Also, if you have fully retired, reached age 65 or met the other conditions of release, you can access more flexible payment rules and tax benefits. We have discovered general rules of the income stream and what HESTA can offer us. As the last section, I will share my analysis on customer reviews that have used the HESTA income stream. For the analysis, I used data analysis techniques that can tell you an overall sentiment to a certain product. I’ve collected +300 customer reviews from the product review site and ran my sentiment analysis code to generate a word cloud and a sentiment frequency graph. Have you heard about a word cloud? This fun analysis is a good starter to learn how people describe things around us. With a word cloud, you can see specific words in different sizes. The larger it is, the more people used that word to describe it. For you, I will use this fun technique to help you to better understand this product. Can you see the big words at the center? Yes, they are actual words that the customers used to describe the product. As explained above, they are big because people more frequently used them. 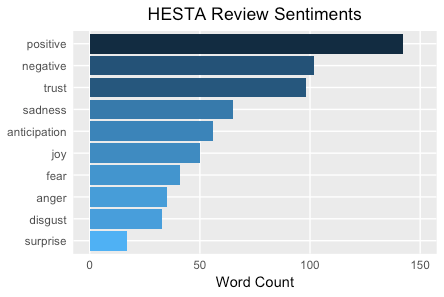 Words like “helpful”, “greatservice”, “excellentservice”, “happy”, and more are in a bigger size, which mean, in overall, people have had a positive experience with HESTA. 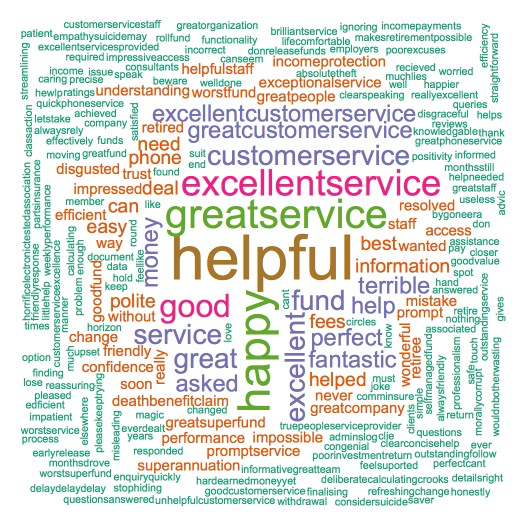 By this word cloud analysis, we can notice that many people especially liked their customer service. In the next section, I will share what types of feeling the customer showed in their review. As a final analysis, I will show you what specific sentiments people had to HESTA. You will be able to see 10 different sentiments such as positive, negative, trust, anticipation, joy, sadness, fear, anger, surprise, and disgust. If you see the chart above, you can see that the positive sentiment takes the largest portion of all sentiments. It’s followed by the negative sentiment. Trust ranked 3rd, followed by sadness, anticipation, and joy. The “positive” and other positive sentiments together outnumbered the rest negative words. We can learn that people are having positive feeling to HESTA. HESTA has been known for their great Superannuation funds with many industry awards. Their HESTA income stream has received positive reviews from actual customers. When I researched their products, I also felt that HESTA is a trustworthy firm. If you are considering an Income Stream option, HESTA can be one of your candidates.